What is the Bridge of Friendship? Every fall, Nā Lei Aloha Foundation invites community contributors to participate at a half-day gathering based on a chosen theme with the aim of starting a conversation. The annual theme is never announced ahead of the time but is revealed as the conference unfolds through various activities. 2012 “Diversity Harmony Peace” – Committing to the process of creating harmony amid diversity in our immediate surroundings will be the first step toward a more peaceful world. How can each of us take that first step? 2013 “Empathy” – The desire and ability to feel what another person feels is the basis for a caring community that is wanting and able to address the needs of all. 2014 “Resilience, Reclamation, Renewal” – Cultivating resilience allows us to bounce back from our challenges, big and small. When we identify and understand the things that renew our spirit, we can act to reclaim ourselves and move forward toward the future. 2015 “We” is inclusive. It is simple. It is all-accepting and holds no sense of division or hierarchy. It spans past, present and future. It includes everyone without the need to understand or empathize. We come to the table as unique individuals, but in honoring “we,” we enlarge our capacity by allowing ourselves to cast a wide enough net for everyone to find their place within a solution. 2016 “Kuleana” – To accept something as “kuleana” is to gratefully receive and own a task with a deep sense of responsibility and privilege. What is our personal kuleana? What kuleana do we have as a community? 2017 “Light” – We can break through personal darkness and challenges when others offer us the “light” of their support. We find internal courage by seeking “light” within ourselves. When we recognize the needs and struggles of others and offer our “light” through our words and actions, we can experience true joy. 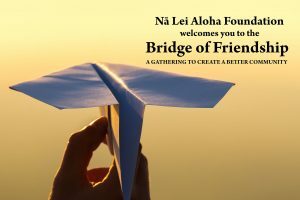 Why does Nā Lei Aloha host the Bridge? Bringing people together is what we do. Nā Lei Aloha’s mission focuses on supporting or creating opportunities for diverse people to come together in ways that encourage uncovering common values and goals. Recognizing our commonalities can be a starting place for respect and cooperation to grow, and this can strengthen our Hawaiʻi community. Our planning team includes past Bridge participants who volunteer their time to design a gathering to benefit like-minded community-contributing individuals, organizations, and therefore the community. Although it is would be difficult to trace all of the direct or even indirect results of people meeting at the Bridge, we have heard a range of results such as organizations forming partnerships toward a singular goal, to individuals simply feeling renewed after being treated to a morning of thought-provoking conversation and getting to know others who are engaged in the community. What makes us most happy is hearing about real friendships that have resulted from meaningful conversation in the comfortable environment of this unique conference. HI Housing Finance Development Corp.
Kokua Mau, Hawaii Hospice & Palliative Care Org.